Daryl Johnson (Worcester Park, United Kingdom) on 25 May 2007 in Architecture. I started a Master's degree in April. 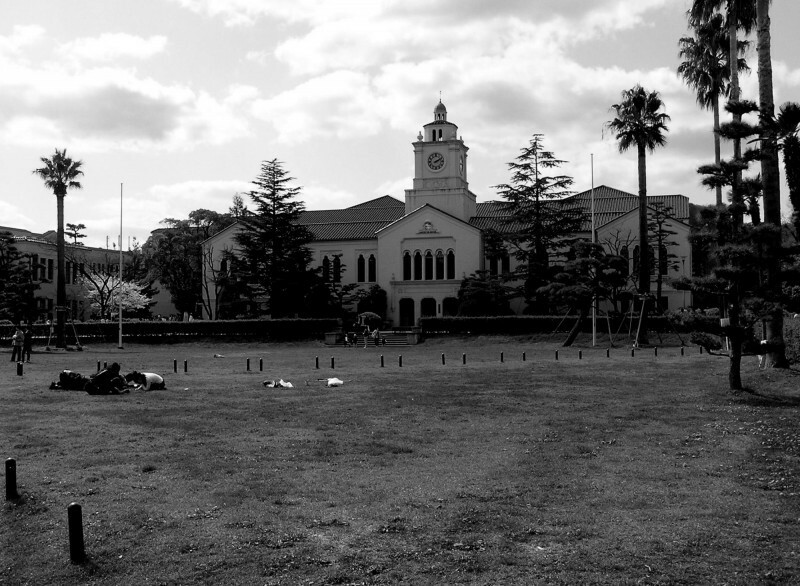 This is my university, Kwansei Gakuin, or 'Kangaku' for short. They have a beautiful campus at Uegahara, near Nishinomiya in Hyogo prefecture. @Art Monkey: No worries AM! Have fun. Lovely scene, and it looks good in black and white, I would wish only that the sky is not so blown out in parts. lovely ultra wide capture of your other "home" for the next year or two! looks like a university with much history! curious what Masters you are doing - Japanese studies? ESL? MBA? @Kairospix: Thanks K! I'm doing an MBA. @Kheoh Yee Wei: Cheers Wei. Hi Daroru, looks like a nice serene environment - the palm trees remind me of Singapore! I like how the people are randomly "placed" in the picture. Adds much life to it! Looks like a very nice place to spend your days! I too love the b/w treatment you gave the photo and wish the sky had been a little less blown out. If you'll forgive my impertinence, I used a layer mask to tone it down and you can see the result <here>. The image has such a clear line of demarcation between the sky and the foreground that making the layer mask was a snap. I've also included the mask <here>. Good tutorial on this at gimpguru.org. Funnily enough, got an e-mail on the 2nd June... university closed down for 2 weeks due to a measles outbreak! I heard this happened in Tokyo, now its moved to Kansai. Don't know if its just a precaution or if some people really got it down here.